I have finished the four (4) racquets in the “G” Speed Tour series. They are the Pro, the MP, the Rev, and the “S”. Each racquet in this series looks the same, has the same head size, the same beam height so what is the difference? 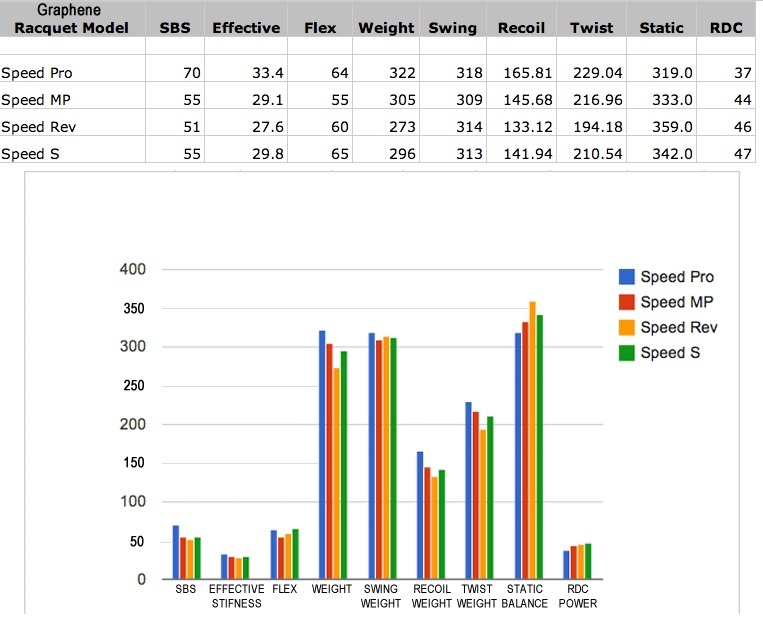 As with every review I do I generated over forty (40) data points for these racquets. These data are meaningful but may be difficult to grasp. So, I have prepared a simple graph to present a quick overview of the variables. With this view it is easy to which is the stiffest or the lightest or the most powerful, etc., based on numbers. Guess which racquet has the 18 x 20 string pattern! SBS, is, by the way “String Bed Stiffness”, which is a very important number. Take a look and let me know what you think, and, if you want to see more racquet reviews, machine reviews, and other important stuff become a member of the International Alliance of Racquet Technicians at www.gssalliance.com. Posted on January 18, 2013, in Racquets - New and tagged "Racquet Reviews", Graphene, head. Bookmark the permalink. 1 Comment.